Home - Who Cut The Cheese? BACK IN PRINT by popular demand! Ten years after its initial release, "Who Cut the Cheese?" is back - and more timely than ever! The classic book about losing jobs and learning to move on has a stunning new relevance in an economy in which "Hope" and "Change" have turned into "Hopelessness" and "Buddy, Can You Spare a Dime?" And frankly, this book won't do a darn thing to either get you a job or fill you with hope. But it will make you laugh...and that's a start! A great gift for anyone and everyone who is trying to cope with today's cheesy economy! And seriously...isn't that everyone now? 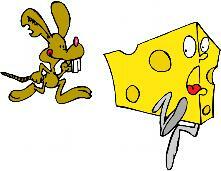 "Who Cut the Cheese? An A-Mazing Parody About Change and How We Can Get Our Hands on Yours" is not in any way associated with, sponsored, or endorsed by Who Moved My Cheese?, its authors, or its publisher, G.P. Putnam's Sons, a member of Penguin Putnam Inc. The intent is good-natured humor and it is not intended to create confusion or to diminish the value of Who Moved My Cheese? 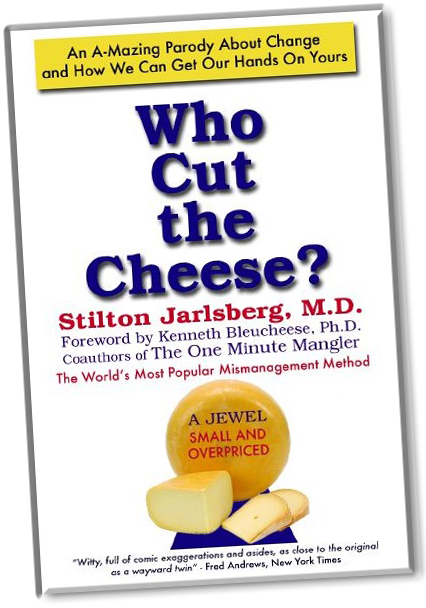 All Contents © Stilton Jarlsberg, M.D.